This morning in church I suddenly realized that the church bell was silent. Yet I didn’t notice earlier that the bell was actually been silent for quite a long period. 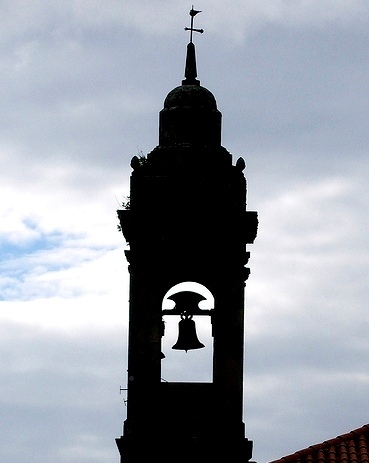 It is a small brass bell hanged on top of the church bell Tower. There is this gentleman whose name is Frederique Korad (we call him FK). FK has been with this church for about 30 years. Nobody exactly know since when he has been in charge of sound system for church service, but all knew that he’s the key man to operate & train other church members on the sound system. Other than operating & supervising the sound room system, FK also did a very good job every Sunday service. He has a talent in ringing the church bell at 10 am sharp on Sunday when the service starts. FK was able to hold the long rope hanging down from the bell tower, tied to the brass bell, and solidly he could swing the bell rope with precise timing for each hit that created a clear resounding vibration. One hit after another, the church bell was sending out crystal clear music to the ears… flew into the nearby community, every Sunday in the past. And maybe, just maybe, one day the church members will recall those wonderful sound coming from the bell tower. FK had done a good job ringing the bell over past many years.